The Ukrainian TV presenter, showman, and actor Volodymyr Oleksandrovych Zelensky is a person of many talents; he quickly found his niche in the Ukrainian and Russian show business. Today, he is at the top of the most powerful people in Ukraine and one of the most successful producers. At the beginning of 2019, he announced he was going to take part in the presidential elections. The would-be artist was born in an industrious town Kryvyi Rih in January 1978. Although the family was Ukrainian, they lived in Mongolia for a while. The boy’s father, a trained mathematician, worked there: Oleksandr Zelensky participated in the construction of a mining and concentration complex. Later, he became a professor at the department of cybernetics and computing hardware. The mother, Rimma Zelenska, was an engineer. According to the Mongolian law, little Vova entered a primary school at eight. He could speak the language fluently, although he forgot it when the family came back to Kryvyi Rih. Soon, Volodymyr joined a theater club and started doing sports. The boy was active and fidgety. He used to dream about becoming a border guard; later, Zelensky wanted to be a diplomat or a translator. Volodymyr Zelensky entered a local branch of the Kyiv National Economic University to study law. The student’s artistic abilities and humor manifested themselves quickly, and he was invited to stage dance shows for the KVN Zaporizhia-Kryvyi Rih-Transit team. In a while, Zelensky began to appear in the team’s performances as well. In 1997, the young man and several KVN participants organized their own group, Kvartal 95. He not only became the team’s captain but also wrote scripts for the majority of events. Two years later, The Major League of KVN invited the talented youth. The jury appreciated their humor, and the young people became popular enough to give concerts all over CIS. In addition to concerts and tours, Volodymyr Zelensky created scripts for corporate parties and events. Kvartal 95 performed in KVN until 2003 when Zelensky and his group had a conflict with AMiC company and left. Ukrainian channels were interested in Kvartal 95. The 1+1 channel offered them to have their own program with their best sketch scenes. The team transformed into Studio Kvartal 95; Zelensky became its administrator and owner. Volodymyr is not only a successful comedian and TV presenter but also a good actor who has participated in many full-length movies and musicals. The artist debuted with the comedy Unwilling Womanizer in the early 2000s; soon, he played d'Artagnan in the Christmas musical Three Musketeers with Anna Ardova, Ruslana Pysanka, and Alena Sviridova. Besides, the movie Ride Two Horses was among the actor’s first works. In 2005, the program Evening Quarter on the 1+1 channel was premiered; soon, Inter channel bought the rights on it. Zelensky was the lead presenter and the author there. The project proved to be popular soon. Volodymyr’s studio continued to present new works, such as The Fight Club, Evening Kiev, and Ukraine, Rise! so that the popularity level remained steady. One of the brightest stars, Zelensky often received invitations to participate in popular TV shows. In 2006, he collaborated with Olena Shoptenko in the Ukrainian TV project Dancing with the Stars. Eventually, the duet won the victory thanks to the audience’s support: they had substantially more votes than their rivals. Further on, Volodymyr Zelensky and Ruslana Pysanka became the presenters of the TV show Office Romance on Inter. In 2010, the artist joined the program Make a Comedian Laugh with Dmitriy Shepelev. The next year, the man cohosted the Russian show Factor A with Philipp Kirkorov. At the same period, the movie Love in the Big City was released; it was Volodymyr’s first work in a full-length movie. The romantic comedy also starred the former member of Nu Virgos Vera Brezhneva and the actors Aleksey Chadov, Ville Haapasalo, Anastasiya Zadorozhnaya, and Svetlana Khodchenkova. The work had many positive reviews from critics; the audience also liked it. In a while, two sequels of the movie followed. Soon, Zelensky played in the remake of the popular Soviet movie, Office Romance. Our Time, yet it was severely criticized. In 2010-2012, the showman worked as a general producer of Inter. In 2013, he was invited to host a new music program I Wanna Join Nu Virgos. Two years later, the comedy show League of Laughter based on Studio Kvartal 95 was released; guarded by their mentors, comedian teams competed among themselves. Volodymyr Zelensky was the show presenter. Oleksii Potapenko, Elena Kravets, Nadiia Dorofeieva, and Vladyslav Yama used to be the jury members and coaches. According to Forbes, Zelensky earned $2 million thanks to that project. In 2012, the Kvartal 95 team took the second position in the top 25 prominent media projects and show-business stars in Ukraine. Only Wladimir Klitschko surpassed them; however, the comedians managed to beat Ani Lorak, Potap & Nastya, and Nu Virgos. Soon, Volodymyr appeared in the comedy Rzhevsky Versus Napoleon where he personified the French emperor; the project reviews were ambiguous again. In 2012, the artist gained a role in 8 First Dates; its sequel, 8 New Dates, was released in 2015. The actor personified Nikita Sokolov in both movies; Vera Brezhneva replaced Oksana Akinshina in the lead female role. In 2015, Studio Kvartal 95 created a new political comedy Servant of the People; many notable figures of the Ukrainian political circles became the object of satire. Volodymyr played the Ukrainian President. The audience liked the series so much that its sequel came out in 2016. The artist and Kvartal 95 are known for their producing projects, such as the family comedy series Svaty. Zelensky and his colleagues worked on six seasons. Besides, they created the musical New Year’s Svaty. 2012 was marked with another comedy series, Daddies starring Roman Madyanov, Sergey Gazarov, and Tatyana Dogileva; Zelenksy worked as a producer. The movie had a high rating. In 2018, the man tried himself as a director; David Dodson and Zelensky created the movie Me, You, Him, Her premiered at the end of the year. Volodymyr produced the project and played the lead part as well. Yevhen Koshovyi and Nadiia Dorofeieva starred there, too. The comedian posted his photos on Instagram: he had his hair and mustache grown for the role. Fans were excited to see those pictures. When the political crisis deteriorated and the military actions were taken in Eastern Ukraine, the actor and his colleagues not only gave concerts for Armed Forces of Ukraine soldiers but also donated ₴1 million for the army. The comedian often mocked at Russia and Russian politics in his speeches; the country’s president Vladimir Putin was not an exception. Soon, Zelensky had some problems: his show Evening Quarter was canceled on the Russian television, and the work on the new season of the successful series Svaty was blocked. In winter 2015, the Investigative Committee of Russia started checking the information about Volodymyr’s and other cultural figures’ financing of the Ukrainian special service agents. It is notable that the artist himself was against the prohibition of his Russian colleagues’ entrance to Ukraine. Not all people like Zelensky’s jokes about Russia. In 2014, the showman was hospitalized with many hematomas: somebody beat the artist late in the evening in the Kiev embankment. As Volodymyr marked in his interview, they were “pro-Russian”. The situation could have been worse if it had not been for a stranger who was going to call the police. Zelensky thanked him generously. In December 2014, Zelensky’s car parked near Hotel Ukraine in Kiev was set afire. The next year, there was the information that the police found the band that was going to attempt the comedian’s life; they also planned to attack Volodymyr’s family. After that, the man had to hire bodyguards. 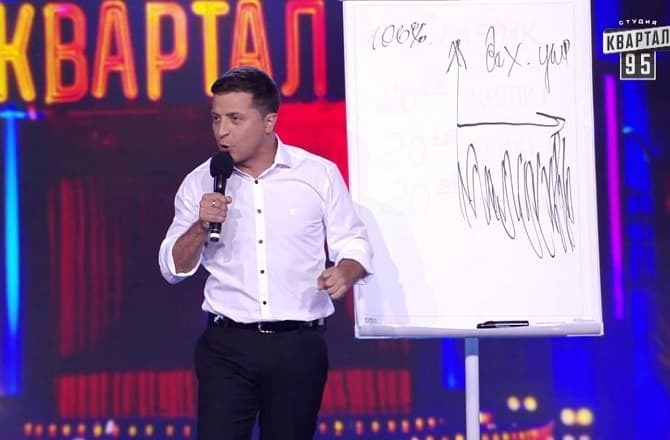 In 2016, the new scandal with Zelensky and Kvartal 95 broke out: the Ukrainians felt bitter because of his sketch in Jūrmala. The country was shown as a beggar that asks neighboring countries for money to keep it forever. 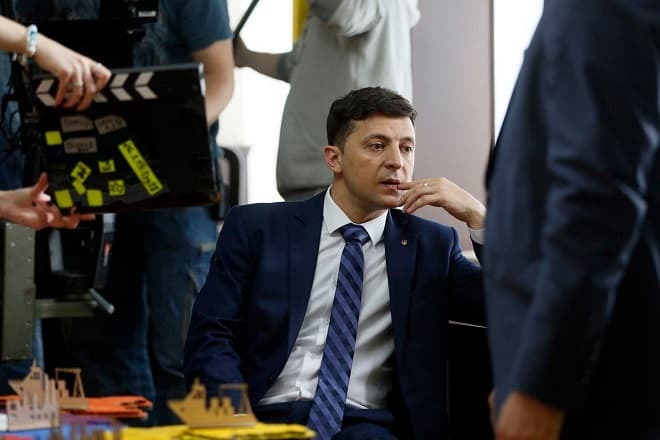 In 2017, Zelensky started working on the seventh season of the series Svaty; the Ukrainian authorities did not appreciate that. The project was banned in the country; one of the lead actors, Fyodor Dobronravov, was prohibited from entering the country for three years. The government would not soften the situation, and Volodymyr had to stop working on the sitcom. The producer posted an angry message to the authorities on his Facebook page. Three months later, the actor confirmed that the issue had been solved positively. Nowadays, Volodymyr Zelensky is at his career and artistic peak; he celebrated his 40th birthday in 2018. The man’s height is 5.58 ft. (170 cm. ), and his weight is 138.89 lbs. (63 kg. ); he looks athletic. The actor is married to Olena Zelenska whom he had been dating for seven years before the marriage. The couple met at school: they studied in the parallel classes. The woman is one of the authors for Studio Kvartal 95, although she is a trained lawyer, just like her husband. Olena and Volodymyr married in 2003 when the team left KVN. The next year, the couple’s daughter, Aleksandra, was born. The son Kiril was born in 2013. According to the comedian’s friends and family, Zelensky is an exemplary family person. He believes that a man should be responsible for his children, family, and close people. The showman often pampers his kids, as well as his wife, to make some compensation for his frequent business travels. There have been some rumors about the artist’s private life. In 2012, he met the actress Oksana Akinshina at the movie set of 8 First Dates. Some sources claim that the couple used to date, but Volodymyr denied that in one of his interviews. Nowadays, Ukraine is dealing with the presidential elections that took place on March 31, 2019. Volodymyr Zelensky was one of the candidates. The news about his participation in the pre-electoral campaign appeared in summer 2018. On December 31, 2018, the artist officially announced he was going to run for the presidency. He delivered a speech on 1+1. The channel administration took that step against the congratulatory speech of the then president Petro Poroshenko that was broadcast later. 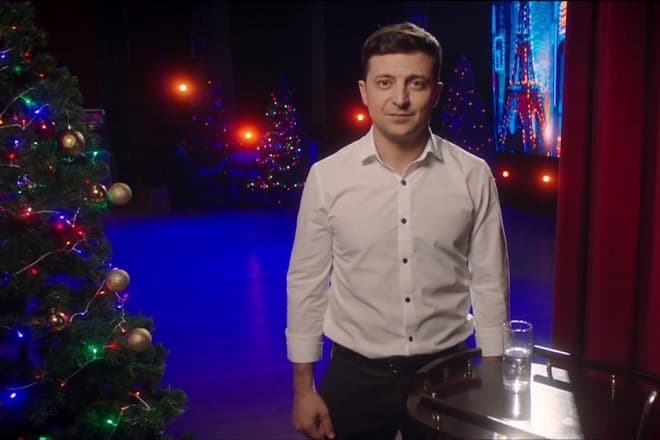 In his first address to the Ukrainian people, Zelensky marked the major ideas related to the urgent issues: the cessation of the military actions in Donbass, the relationships with the International Monetary Fund, European Union, NATO, and so on. Volodymyr Oleksandrovych was officially registered as the candidate on January 21, 2019; he represented the party Servant of the People that had been founded three years before that. The initial name was “Party of Decisive Change”. Ivan Bakanov who promoted Studio Kvartal 95 is the leader of the organization. Volodymyr Zelensky quickly became one of the pre-electoral campaign front runners. By the end of January, the candidate’s rating was 21% which was 5-6% more than those of Petro Poroshenko and Yulia Tymoshenko. At the beginning of February, the number of respondents who supported the artist increased by 5-7%. According to political experts, Volodymyr’s popularity can be explained by the non-standard form of his pre-electoral campaign. The producer shares the recent news about the presidential campaign in the form of the Internet show; he gives his followers in social networks the chance to see the results of his political activities.